It is my pleasure to welcome Krista Davis back here today!!! How Smart Is Your Dog or Cat? Many years ago, as I prepared to leave on a date, I told my dog I would be home in a few hours. Apparently, that upset my date. At dinner, he began with, “You know your dog doesn’t understand what you say, don’t you?” Then he launched into a lengthy lecture. He told me dogs have brains the size of walnuts and can’t think. He explained in some detail that dogs merely react to tones of voice. According to him, they can distinguish between angry and happy tones, but nothing more. Of course he hadn’t! You can imagine my laughter when he confessed. It was our one and only date. Clearly, we weren’t right for each other. No big loss. He was a pretty bright guy (about other things) whom I saw at social occasions now and then, but the dog conversation is the only thing I remember about him. Anyone who has ever had a dog can tell you how smart they are. My golden retriever tricks one of my dogs when he’s sleeping where she wants to be. She stares at him first. I can see the annoyance building. Next, she goes to the door and asks to go outside. The minute she’s outdoors, she barks. The other dog wakes, rushes outside and before he’s fully out the door, my golden retriever races back in and makes herself comfortable where he was sleeping. What amuses me so much about this little trick is that it takes planning. She knows exactly what she’s doing. Researchers at the Max Plank Institute determined that a dog understood about 200 words. And now there’s another dog, named Chaser, who understands over 1,000 words. That probably won’t come as a surprise to dog owners. Or to cat owners, for that matter. My cats know what “squirrel” and “bird” mean. My dogs know people’s names, too. There are names I can’t say without all the dogs barking and running to the front window to look for that person. I think they’re much smarter than we give them credit for. In my new book, Murder, She Barked, the animals don’t speak, but they help the protagonist solve crimes. What clever things do your dogs and cats do? To celebrate the launch of Murder, She Barked, Krista’s dogs and cats are looking for dogs and cats to join their street crew. They’re giving away Murder, She Barked bandanas to two lucky dogs or cats who leave comments here today (it’s okay if their people leave comments for them)! 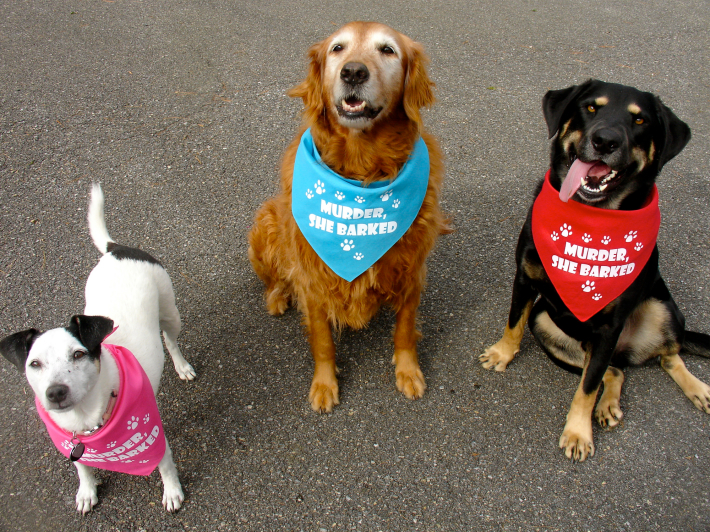 Photos of winners (hopefully wearing their new Murder, She Barked bandanas) will be posted on Krista’s website (http://kristadavis.com/paws-and-claws-mysteries/murder-she-barked-street-crew.html) and on Pinterest (http://www.pinterest.com/kristadavisbook/murder-she-barked-street-crew/) so your dogs and cats can share with their friends. 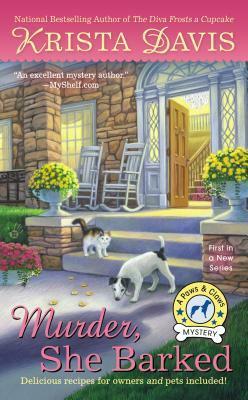 Krista Davis’s new series for animal lovers debuts on December 3rd, with Murder, She Barked. 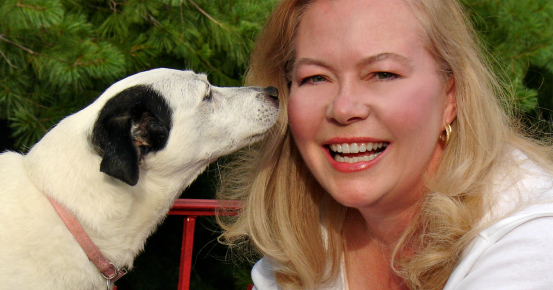 Like her characters, Krista has a soft spot for cats, dogs, and cupcakes. She lives in the Blue Ridge Mountains of Virginia with three dogs and two cats. The Diva Frosts a Cupcake is the seventh book in her Domestic Diva Mystery series. Three of those books have been nominated for Agatha awards and three have made the extended New York Times Bestseller list. Holly Miller’s life has gone to the dogs. She has no job and her boyfriend’s old girlfriend wants him back and since she is his boss’s daughter she is always around. Then she gets a phone call to return home to Wagtail from her grandmother’s friend saying her grandmother needs her. She wastes no time, hops into her boyfriend’s car, tells him she will call when she knows more and heads to Virginia. She makes a quick stop for gas before heading up the mountain and picks up a “hitchhiker” – A Jack Russell Terrier who has been left behind by someone makes himself right at home in the car. When they reach Wagtail both are welcomed with open arms. Her grandmother seems fine but Holly decides to stick around. It’s been a long time since they have spent time together and she thinks her grandmother is keeping something from her. Then she learns there was a hit and run accident and one of the Inn’s employees was killed. Holly thinks it may not have been so much of an accident. She is like a dog with a bone as she and her furry friends do their best to sniff out the killer. 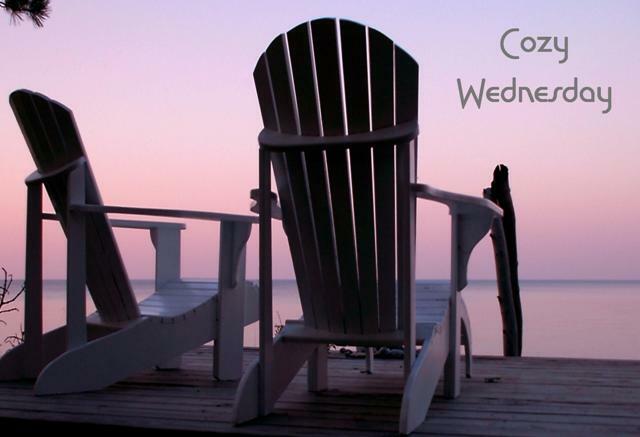 What a wonderful idea for a cozy mystery series – Paws & Claws!! Wagtail sounds like an animal lover’s paradise. Imagine a town dedicated to pets and their humans. Because you know we don’t own out pets, they are part of our family and they each have their own person/s. My husband is definitely our 2 dogs person. They tolerate being left here with me while he is at work but when he gets home I no longer exist unless they want to lick my ice cream bowl. The Jack Russell and a cute little calico kitten have both chosen Holly as their person. Krista Davis has created a wonderful setting in Wagtail. There is no way to describe this idyllic place in this review, you will just have to read the book. I would love to live there 365 days a year. She has also given us a wonderful group of characters both 2 legged and 4 legged. Unique, colorful and real and they span all ages. Add to that a well-plotted mystery that keeps us guessing to the finish. If I had a tail it would be wagging in pure delight. I loved this story!! A fantastic series debut!! I cannot wait for my visit to The Sugar Maple Inn. courtesy of Penguin to give away! Leave a comment for Krista for 5 Bonus Entries and an entry to win a bandanna! Cat jumped onto man’s chest as he tried to enter home uninvited. Man backed off. My cat plays fetch with his toys just like a dog. I had a cat years ago who did the same thing as the above commenter’s cat. Hilarious! I don’t have any pets right now but when I was a kid I used to lie on the floor to read the newspaper and my dog would stand on the paper so I’d pay attention to him instead of reading. We have 2 dogs who are excellent guard dogs. They will bark if a leaf falls off a tree!!!!! We lost our dog over 5 years ago and haven’t had the heart to get another one at our age she might outlive us. I used to have a cat that would come running from wherever she was in the house every time I was talking on the phone with my mother. I’d have to put the phone to her ear while my mother talked to her. As soon as my mother said hello Pumpkin, it’s grandma, Pumpkin would rub her face all over the receiver and purr like crazy. If i was talking to anyone else she could care less. One of our Huskies learned to claw at the door when he wanted out well now he claws on every door to get into a room. How people can be so mean to animals is beyond me. To abandon a dog (after treating it so badly) is just awful! I’m glad the Jack Russel found a good person. I don’t have any pets now but I had a rabbit who would pick up her toys when I named them. My dog Bogie is the guard whose instincts are better than human ones. Guido, my Maltese, has the ability to know what you are thinking and planning. I have a cat named boo that can open doors and dresser drawers no matter how I latch them ! My beagle can open the screen door to go outside. He jumps up and hits the lever to release the lock. My 2 dogs know what it is when we say, want to go to Maine? Their ears perk up and my Ace’s head tilts to one side. Ace also knows who Grampi, Uncle Richie and Dave are, along with Mummy and Daddy! I just loved reading all of these lovely comments about everyone’s pets. I definitely agree that they are a lot smarter than people give them credit for. I have certain things I can’t say around my dogs because they know what I’m saying. I also have a cat that will open doors, drawers, etc. and I still can’t figure out how. I could go on with the funny stories. One of our cats, Tasha, has a nightly routine. She knows she’s not allowed on my dresser. So when I get into bed and settle down with a book, she jumps on the dresser to get my attention. I tell her to get down, and she comes over on the bed to get her head rubbed. If I stop paying attention to her while (or because) I’m reading, she jumps off the bed and gets up on the dresser again. This goes on until I turn out the light. At that point she knows that it’s time to give up, because I’m going to sleep. I actually taught my one cat Sparta to “sit” and our other Neris if I said bang he would lay down (he is now gone from us). My dog Mesa taught himself that when someone knocks on the door, he runs into the powder room to be shut in while we answer the door. Both of my dogs know without me saying anything when I am going to take them with me, when I go to the pharmacy (where they know they get a dog biscuit) or to the post office. They love to ride in the car. I love your post, because we own a Peek-a-poo named Prissy. My Mother and I live together and needless to say, Prissy runs this house and she’s a diva. She’s more my Mother’s dog than mine. I’m only good for certain things and then I am tolerated. Our first dog, Jess, was a poodle. He would eat his evening meal when we would, so his plate was placed at the corner of the table. We would always say ok time to ask the blessing. One evening I noticed that when we bowed our heads over the table to ask the blessing, he would put his head under the table. It was so sweet. My dogs know words too. They know “outside” and “dinner” and “get your toy.” They may understand “Leave me alone,” but they never obey it! One of our dachshunds plays catch by herself if no one will play with her (she will make you play for hours). She throws the ball for herself then catches it. My dog is very affectionate,he does do one or two tricks. Our black lab liked to run to the end of our dock and jump in the lake at our cabin. Any book with a dog on the cover seems to reel me in! Snickers (cat) can jump on the arm of wooden bench and can open our front door with his paws. He has not learned how to open the screen door. my dog knows certain words and you have to be careful not to say them like treats she will stare at you until you give her one.or bed she runs down the hall to the bedroom expecting to go to bed. Nice post, sounds like a good book! This looks like a really good book. I’m adding it to my TRL. I have 3 cats, 2 boys and one girl. Not sure they really do anything cleaver, they all have a love/hate relationship but sometimes I will catch them all napping together on my son’s bed and then I think they really do love eachother and they all look at me like they are guilty and they have been caught. When I was younger, we had a farm dog that would follow us in our car when we left our home ( he followed for about a half mile on the country road )…then when we got back home, he was still in the same spot waiting for us. I enjoy Krista’s other series and can’t wait to start this one! Our dog knows just where to stand in the kitchen (between me and the cupboard) to catch anything that may come flying off the cutting board. My German Shepherd is extremely loyal and agile. We put him behind our barn one day away from his normal place of guarding the courtyard. He climbed the roof of the barn determined to guard his family. It was at least 50 feet off the ground and snowy! My dog can pull back the covers on my bed, get under them, and be sleeping there with his head on my pillow. My cats can open the kitchen door but only one of them can do it without leaving it open for the dog! The dog is more manipulative than clever. He will paw at the laptop on my lap to get under it or under the covers!